On this long awaited effort, Springsteen eschews the tight dense sound of his acclaimed "Born To Run" to put the emphasis on his unique throaty singing style. While more sparse, the music is equally powerful, with the seven-man band behind Springsteen aided by the studio prowess of the producers along with Steve Van Zandt, Jimmy Iovine and Charles Plotkin. Springsteen's lyrics continue their exploration of doom and adolescent angst as perceived is small New Jersey towns. This is the type of album that grows with each listening. Best cuts: "Adam Raised Cain," "Factory," "Prove It All Night," "Darkness On The Edge Of Town." The delayed release of this album served notice that Springsteen, like Stevie Wonder, would not churn out product by any set schedule. Three years had passed since his previous work, Born to Run. In truth, the gap would have been shorter had he not been absorbed for the better part of the year in a legal scuffle with his former manager. Also like Stevie Wonder, Springsteen did not merely record enough tracks to fill an album, but wrote many songs and selected numbers that would work together to produce the effect he desired. As with Stevie, some numbers were given to other artists, some retained for future albums, and several consigned to seemingly interminable limbo. The effect Bruce and his producers did create with this album was intense and powerful, too strong for AM radio. Though several tracks were outstanding, none emerged as hit singles, "Prove It All Night" and "Badlands" peaking in the mid-third of the Hot 100. In 1987, Darkness on the Edge of Town was chosen by a panel of rock critics and music broadcasters as the #59 rock album of all time. Contractual disputes kept Springsteen out of the studio for a couple of years. So when he bounced back after two years of intensive touring he had hardened his performance and honed his professionalism. The lyrics of these new songs were written from a more mature viewpoint -- teenage obsessions replaced by a working man's concerns. Another Jimmy Iovine/Record Plant recording, Darkness is far tighter and "shifts gear" so much more easily than Born to Run. The deliberate padding out of the sound is no longer indulged in and the recording sets out to capture the band straight-head on. Springsteen's screaming delivery in a song like "Adam Raised a Cain" is still robbed of much of its impact by the relatively two-dimensional recording. The density of sound leaves the album without ebb and flow. Coming three years, and one extended court battle, after the commercial breakthrough of Born to Run, Darkness on the Edge of Town was highly anticipated. Some attributed the album's embattled tone to Springsteen's legal troubles, but it carried on from Born to Run, in which Springsteen had first begun to view his colorful cast of characters as "losers." On Darkness, he began to see them as the working class. One song was called "Factory," and in another, "Badlands," "you" work "'neath the wheel/Till you get your facts learned." Those "facts" are that "Poor man wanna be rich/Rich man wanna be king/And a king ain't satisfied/Till he rules everything." But Springsteen's characters, some of whom he inhabited and sang for in the first person, had little and were in danger of losing even that. Their only hope for redemption lay in working harder -- "You gotta live it everyday," he sang in "Badlands," but you also, as another song noted, have to "Prove It All Night." And their only escape lay in driving. Springsteen presented these hard truths in hard rock settings, the tracks paced by powerful drumming and searing guitar solos. Though not as heavily produced as Born to Run, Darkness was given a full-bodied sound, with prominent keyboards and double-tracked vocals. Springsteen's stories were becoming less heroic, but his musical style remained grand. Yet the sound, and the conviction in his singing, added weight to songs like "Racing in the Street" and the title track, transforming the pathetic into the tragic. But despite the rock & roll fervor, Darkness was no easy listen, and it served notice that Springsteen was already willing to risk his popularity for his principles. Indeed, Darkness was not as big a seller as Born to Run. And it presaged even starker efforts, such as Nebraska and The Ghost of Tom Joad. - John Floyd, The All-Music Guide to Rock, 1995. For anyone who might have thought Bruce Springsteen couldn't sustain the creative arc and evolutionary path attained on his breakthrough album, Born to Run, Darkness on the Edge of Town proved them soundly wrong. With this astounding album, the New Jersey native took his bar-band boogie from the boardwalk to sold-out shows across the States and let everyone know that he would forever be "The Boss." With a title that hints at the invisible corners in life that some can't see into and others choose not to see at all, Darkness 's lyrics represent a streetwise poeticism that is lofty without being highbrow and straightforward without being simplistic. From the badlands to the Promised Land with the wastelands and the heartland in between, Springsteen travels across the American dream as his cast of outsiders, dreamers, and quiet failures yearn for redemption, wisdom, and escape. On "Prove It All Night" he sings "Everybody's got a hunger, a hunger they can't resist / There's so much that you want, you deserve much more than this," epitomizing that basic sense of hope that his songwriting of this period captured so eloquently. You got the sense when you listened to Springsteen that he wanted the same things as his tortured characteres. So, when he sang "For all the shut down strangers and hot rod angels rumbling through this promised land / Tonight my baby and me, we're gonna ride to the sea" in "Racing in the Street," you knew that he too was gonna drive to the sea if it was the last thing he did. And you loved him for it. Kicking up a notch the wall-of-sound aesthetic he had so successfully employed on his previous LP, Darkness on the Edge of Town takes out all the exuberance and joy from the mix and leaves the listener to contemplate the music's somber underbelly. This set of material ranks as one of the great examples American songwriting and helped place Bruce Springsteen in the pantheon alongside the likes of Bob Dylan and Johnny Cash. And that is where he remains decades later, still standing as one of the most vital and influential rock 'n' roll artists of all time. Darkness on the Edge of Town was voted the 68th greatest album of all time in a VH1 poll of over 700 musicians, songwriters, disc jockeys, radio programmers, and critics in 2003. 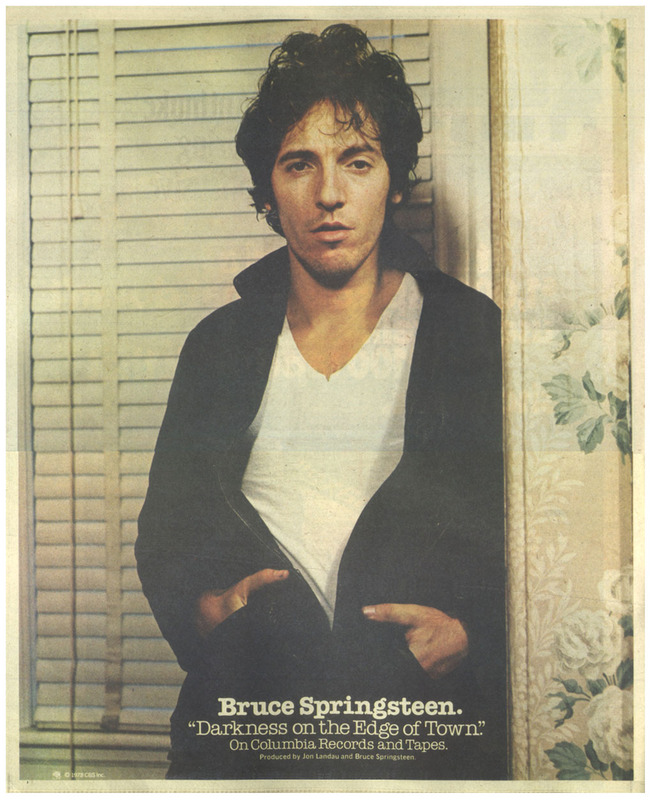 "When I was making this particular album, I just had a specific thing in mind," Springsteen told Rolling Stone. "It had to be just a relentless...just a barrage of that particular thing." That obsession was the aftermath of the epic romanticism of his first three records: songs about people struggling with collapsed dreams. This was tough music, inspired by tough movies by Sergio Leone and John Ford. Recorded after a long absence from the studio (due to a lawsuit against his former manager), Springsteen and the E Street Band played rockers such as "Badlands" and "Promised Land" with barely contained passion. Darkness on the Edge of Town was chosen as the 151st greatest album of all time by the editors of Rolling Stone magazine in Dec. 2003. A near three-year gap separates Darkness On The Edge Of Town and its predecessor, the star-confirming Born To Run, a delay caused by Springsteen's acrimonious lawsuit against his former manager, but in that time he had clearly lost none of his energy and ability to encapsulate the American blue-collar experience. Eleven months in the making, sales for the album did not match its predecessor's sales of six million; however, it managed Number Five on the Hot 100 chart in the US, while actually bettering Born To Run 's showing in the UK, peaking at Number 16. Darkness On The Edge Of Town was intended by Springsteen to be a more sparse record than his previous album, but it sounds just as powerful. "I just had a specific thing in mind," Springsteen explained later, "It had to be relentless." 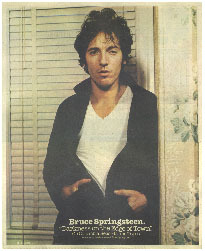 A lot has been made of the creative influence wielded by producer -- and later to become Springsteen's manager -- Jon Landau, who is said to have guided the singer/songwriter back towards a more stripped-down sound, with songs averaging four minutes in length, and certainly the album's overall brevity is a new departure, albeit that "Racing In The Street" was a portent of things to follow on his follow-up, The River. As of 2004, Darkness On The Edge Of Town was the #67 best-selling album of the 70s. Thanks to a legal dispute with former manager Mike Appel, Springsteen had three years to bask in the stellar success of Born To Run, and to comtemplate its follow-up. The resulting album, Darkness On The Edge Of Town, is a very different beast from its predecessor. Like Dylan before him, Springsteen withdrew from fame, moving to a farm in New Jersey so he could refocus on "life in the close confines of the small towns I grew up in." He wanted to "write about the stress and tension of my father's and mother's life that came with the difficulties of trying to make ends meet." (The album was originally to be called "American Madness," after a Frank Capra movie about the Depression.) Fatherhood is one of the album's themes ("Adam Raised A Cain"); struggle another ("Streets Of Fire," "Factory"). These are songs about small-town frustration, sometimes sexual ("Candy's Room"), sometimes social ("The Promised Land"). Being Bruce, the angst is tempered with romance, particularly for the road -- many songs involve driving, either for escape, for thrills, or both -- but musically, this is a much more subdued affair than Born To Run. Clarence Clemons' sax is rarely heard. Instead, Springsteen's guitar and Roy Bittan's measured, melancholic piano set the tone. Uplifting, downbeat, bleak, and mad as hell, Darkness... is a spellbinding B-movie epic to follow the blockbuster of Born To Run. - Peter Watts, 1001 Albums You Must Hear Before You Die, 2005.